Professor Kathy L. Cerminara’s scholarship focuses on end-of-life decisionmaking and the intersection between end-of-life care, palliative care, and health care coverage policy, particularly coverage of hospice care. She has taught at Nova Southeastern University Shepard Broad College of Law since 1998. Professor Cerminara has been a member of the International Scientific Committee for the International Academy of Law & Mental Health, based in Montreal, Canada, and is an affiliate member of the Health Law and Tort Trial and Insurance sections of The Florida Bar, and a retired member of the Pennsylvania Bar and the American Bar Association. Part of the End of Life Liberty Project Advisory Committee, she is also an active leader in the Southeastern Association of Law Schools and a member of organizations such as the the American Society of Law, Medicine & Ethics and the American Health Lawyers Association. Prior to joining the Shepard Broad College of Law faculty, she taught at the University of Miami School of Law and St. Thomas University School of Law, clerked in the Western District of Pennsylvania and the United States Court of Appeals for the Third Circuit, and practiced law with Reed Smith Shaw & McClay in Pittsburgh, Pennsylvania. 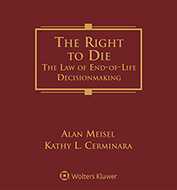 The Right to Die, Third Edition analyzes the statutory and case law surrounding the profound issues of end-of-life decisionmaking. Whether the situation calls for long-term planning or quick, unexpected decisionmaking, this cogent, one source treatise guides you through all the available channels.